Powers/Abilities: White Noise was an adult humanoid who claimed Deathbird to be her mother, thus giving her (at least partially) Shi'ar avian characteristics including enhanced strength and endurance. She could generate powerful concussive sonic screams, as well as noise-cancelling blasts, from her throat. She could fly; this seems to have been an innate ability as she fell when blasted in mid-air although she had no wings. There appeared to be some of sort of synchronous mental link between her and her brother, as he was affected by a stun blast taken by her. As a member of the Shi'ar Imperial Guard, she had training in hand-to-hand fighting and was required to follow the orders of whoever was ruler of the Shi'ar Empire. (X-Men: Spotlight on Starjammers#2) - In an effort to stop Deathbird from acquiring the formidable powers of Phalkon (actually the Phoenix Force), the Starjammers pursued her to Earth but found her apparently knocked unconscious on a Shi'ar spaceship floating in the North Atlantic Ocean after a battle with Excalibur. 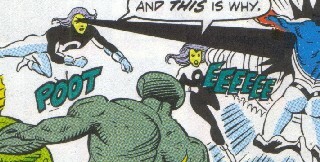 Due to a misunderstanding, the Starjammers and Excalibur fought each other briefly before uniting against a large contingent of the Shi'ar Imperial Guard, who had arrived to protect Deathbird and which included White Noise as a new member. Hovering alongside her brother, Black Light, she attacked Captain Britain using her sonic scream, knocking Captain Britain out of the fight. However, Raza fired his gun using a stun blast at White Noise, knocking her unconscious along with her brother, with both falling to the deck. The two new recruits quickly recovered only to see Lilandra punch out Deathbird who was seeking to siphon the Phoenix Force. White Noise screamed powerfully at Lilandra, knocking her aside. Along with the other members of the Imperial Guard, she retreated through an open teleportal, left open by Widget, that led back to Shi'ar space. (War of Kings#1) - Vulcan surveyed, with Gladiator, the assembled Imperial Guard. Mentor reported they were all battle ready and Vulcan announced his intentions to attack the Kree. They soon engaged in a massive battle with the Inhumans and Starjammers, successfully capturing Lilandra before retreating. During the battle, Black Bolt leapt at Gladiator, but he was momentarily held back by a sonic dampening blast from White Noise, allowing Gladiator to defeat Black Bolt. Members of the Guard in this mission: Astra, Black Light, Earthquake, Electron, Fang, Flashfire, Gladiator, Hussar, Impulse, Magique, Manta, Mentor, Neutron, Nightside, Plutonia, Schism, Scintilla, Shapeshifter, Smasher, Squorm, Starbolt, Titan, Voyager, Warstar, and White Noise. (Realm of Kings: Imperial Guard#5 (fb)) - Gladiator had more of the Guard (Arc, Black Light, Commando, Electron, G-Type, Moondancer, Titan, Voyager, White Noise) assembled at his order, to rescue the stranded team (Fang, Flashfire, Hussar, Manta, Mentor, Neutron, Oracle, Plutonia, Warstar), with Ch'od, Raza, Talon (previously thought to be Smasher), and Quasar, from within the Fault. Voyager, with great strain, opened a gateway to within the Fault, (Realm of Kings: Imperial Guard#5 (fb)) - Gladiator had more of the Guard (Arc, Black Light, Commando, Electron, G-Type, Moondancer, Titan, Voyager, White Noise) assembled at his order, to rescue the stranded team (Fang, Flashfire, Hussar, Manta, Mentor, Neutron, Oracle, Plutonia, Warstar), with Ch'od, Raza, Talon (previously thought to be Smasher), and Quasar, from within the Fault. Voyager, with great strain, opened a gateway to within the Fault, then stayed behind while Moondancer used her powers to guide them through the debris and to the ship, which was surrounded by bizarre and deadly xenoform beings patterned after the X-Men. Comments: Created by Terry Kavanagh (writer), Dave Cockrum (penciler) and Jeff Albrecht (inker). White Noise does not appear to be full-blood Shi'ar and may have a non-Shi'ar father. Deathbird has made no mention of her; it may be that she and Black Light were adopted by Deathbird. UncanyXmen.net comment that her sonic scream could shatter solid objects and provided thrust as airborne propulsion; this is not acually stated in the story, but sounds feasible.